Our latest featured link will direct visitors to the jr.nba.com. What is the Jr. NBA? The Jr. NBA is the official youth basketball participation program of the NBA. I’ve been visiting this website since last year checking out its resources on Twitter…at times retweeting inspiring quotes and watching NBA coaches talk about the core values of the Jr. NBA. Everything about our love for basketball revolved around the NBA as kids. Back when kids wasted allowance money collecting basketball trading cards, I probably knew the full names and statistics of basketball rosters by memory better then I knew the names and details of some of my own extended family members…and we’re talking about the megabyte sized memory of a 10 year old kid. To a child, the NBA has an overwhelming influence on how kids view future goals (“when I grow up I want to play for the NBA!! !”) and how kids socialize and connect with the greater community. Whether you were playing with a summer league that referred to themselves by an NBA team name like the Lakers or Magic or were outside as a kid trying to debate who you thought was the best NBA basketball player in the world…for kids who love basketball, the NBA captivated our imagination while we were awake and wandered into our dreams while we slept. As the 20th century came to a close (1990s) technology took the game beyond just a picture and a few stats on a trading card. Technology brought children closer to hoop through video games, increased broadcasts on TV, and news channels like ESPN or NBA Inside Stuff. Even magazines began to blend ink with the emerging Hip Hop culture that played the soundtrack to our adolescent years…it inspired the style on our feet creating a sneaker con$umer culture…inspired how we wore hats and the kinds of $tarter jackets we wished for during winter…til’ this day kids year round are walking adverti$ements for the NBA…short$, sock$, jersey$, bed sheet$, towel$…you name it the NBA sell$ it. As we thought about the mission of #every1plays at the beginning and the kind of values we wanted to promote to kids and parents, the goal was to think about an approach that went beyond the superficial stuff. An approach I wanted to articulate in writing and document. My hope was to create a mission that would describe the core values of a team with greater purpose than simply winning or reducing one’s hoop dream to the wishful thinking that we could coach kids towards becoming a future lottery pick. I thought about the teachable moments that exist in basketball that often get lost in the translation of competitive sports culture. A culture funded by the bottom dollar politics of an entertainment mill that divests from children and community. The kind of culture that creates microcosms in communities where families simply can’t afford to get their kids involved in organized competitive sports or the “only the best” mentality of school sports. And while we may see a glimpse of the NBA’s connection to community after a commercial about car insurance, a KIA, alcohol, or McDonalds…whether or not anything real exists for the future gets lost in the commercialized hype of being sold something. As we continue to imagine #every1plays in the context of a more organized initiative, I look forward to referencing the Jr. NBA’s site for information. 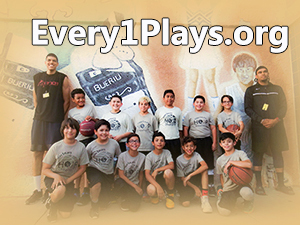 We’re still understanding what this concept of #every1plays can be about in our own community. Please do check out the Jr. NBA at jr.nba.com and follow on Twitter @jrNBA and Like at Facebook.com/jrNBA.